Andy Gotts has been a celebrity photographer for more than two decades. For his latest project, Behind the Mask, he photographed over 100 Bafta winners and nominees. He often shoots in black and white and is one of my heroes for being able to bring out an aspect of personality of every subject. His portraits are simple, natural and not over-produced. A selection of pictures from this project are on show at Somerset House in London, from 20 January to 7 February, together with the photographer's own comments. Below one of my favourites and a story behind the shoot. 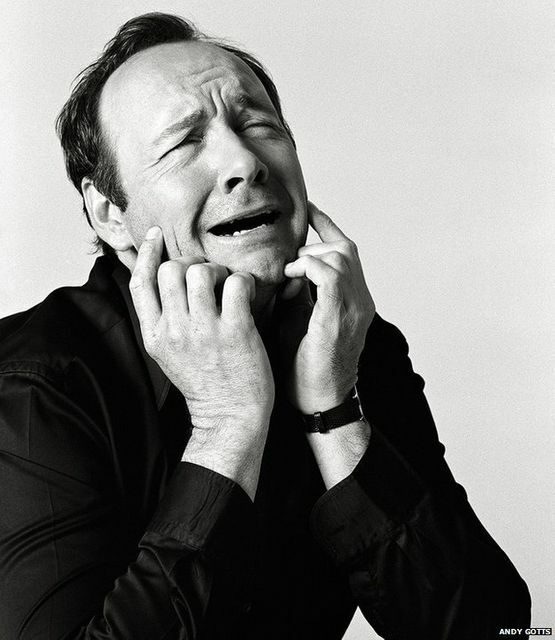 Kevin Spacey's portrait. Like most actors he has a range of faces which he must pull for every photographer. I wanted something different, so I told him to close his eyes and think of the most horrendous thing that could possibly happen to him and emote it. We got it in one frame.